Painted swatch of Cobalt yellow. An expensive yellow that was briefly in vogue. It is of very pure yellow color and is lightfast but has only fair hiding power. Introduced as a pigment in 1852, it replaced an earlier pigment called Gamboge, an Asian yellow gum used until the 19th century. 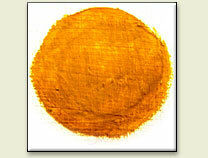 Cobalt yellow remained popular until the late 19th century, when less expensive, cleaner and more lightfast pigments like the Cadmiums were introduced. Word origin: The name "Cobalt yellow" comes from Middle High German kobolt = an underground goblin (cobalt was thought to be detrimental to silver ores). One common way of identifying a pigment and distinguish from mineral and synthetic mineral pigments is to look at them under an optical microscope. Crystals found in modern pigments are far more uniform in size than the ground-up particles found in ancient mineral pigments. While anyway, mineral pigments particles show up as grains without a specific form, an exception is cobalt yellow whose crystals have a leaf-like form, as shown in the micrograph.